Fluid Components International (FCI) has released its new VeriCal™ In-Situ Calibration Verification System for gas and flare flow meters. The VeriCal System is a sophisticated device that allows technicians to confirm flow measurement accuracy in only minutes, saving time and lowering operating costs in flare gas applications aboard offshore platforms and land based oil and gas, and chemical plants. With the VeriCal In-Situ Calibration System, validating flow meter calibration is no longer labour intensive, costly or challenging. The system allows for the verification of flow meter calibration without removing the meter from the pipe or process and makes it easy to meet process validation more effectively and comply with environmental regulation requirements. In the past, flow meters had to endure the cost and hassle of being pulled from the process, then returned to the manufacturer or a calibration lab for testing and then shipped back for re-installation. 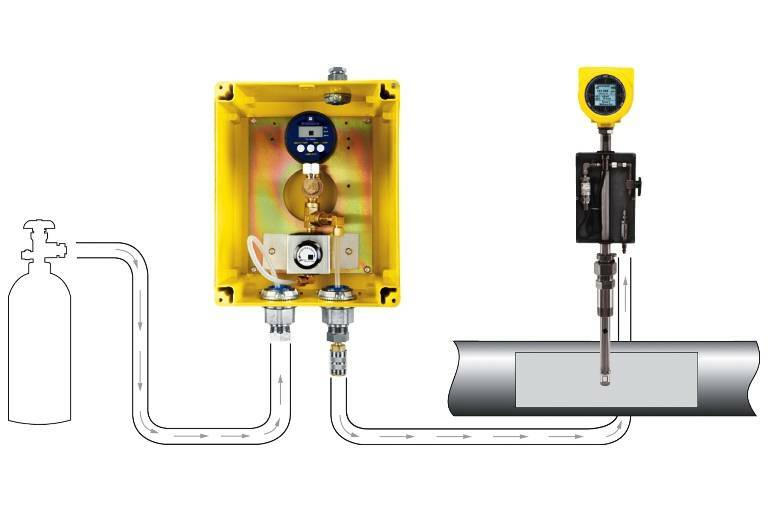 The VeriCal System, working with the latest air/gas flow measurement products from FCI, is the easiest, fastest and lowest cost way to confirm gas flow calibration accuracy. It is ideal for flare gas applications in offshore oil/gas production and refining and other applications where periodic flow meter calibration validation is required by the process or environmental regulations. The VeriCal In-Situ Calibration System combines a specially manufactured and plumbed air/gas flow element with additional electronics that feed and measure a precise flow of gas from a nitrogen source. To test a flow meter, the nitrogen gas is flowed through the meter’s flow element and measured against five benchmark measurement points across the meter’s range. The in-situ flow meter test data is then compared to original FCI laboratory calibration and installation benchmark test data for the meter. Performing a verification with VeriCal also provides a secondary benefit of cleaning the flow element sensors which helps ensure performance and reduces the need for routine maintenance. FCI’s next-generation VeriCal In-Situ Calibration Verification System will debut at OTC 2011 in Houston. The system is designed to work with a variety of FCI’s gas mass flow meters for flare flow measurement. FCI flow meters feature highly reliable thermal dispersion technology, no-moving-parts flow element design, protected by a rugged enclosure. They feature constant power technology, a wide turndown range, multiple gas calibration groups, operate in process temperatures up to 454° C and are calibrated to exacting process and fluid conditions. FCI’s advanced VeriCal In-Situ Calibration System and air/gas flow meters are designed to comply with the recent US Minerals Management Service (MMS) mandate per final rule, 30 CFR Part 250, Subpart K, Section 250, stipulating that all domestic US offshore rigs processing more than an average of 2000 bopd must install flare/vent gas flow meters. These regulations are intended to protect the environment through the monitoring of greenhouse gases (GHG).